The ethnic and linguistic make-up of international seafarers has undergone some profound changes over the past half century or so. It is a fact that the learning of English as a second language comes easier to some than to others. There is clearly the factor of personal language learning aptitude, but other aspects play a role also. If the linguistic background of a person lies in the Teutonic language branch then he or she will generally have little difficulty in grasping English relatively fast. More challenging is the learning of the tongue for someone from one of the other five branches of the Indo-European languages such as Indian, Persic, Celtic, Graeco-Latin or Slavonic. Harder still is the acquisition of English for persons whose mother tongue belongs to the families of Altaic, Sino-Tibetan or Afro-Asiatic languages. 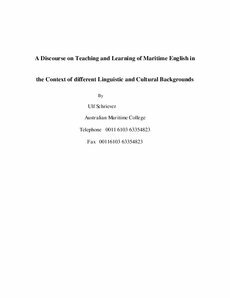 Where the usage of a codified language - as in the "Standard Maritime Communication Phrases (SMCP)" - is concerned such fundamental differences may seem of little consequence as phrases are short and simple in terms of language structure. However, even here pronunciation remains a serious problem with some speakers from a NESB. More importantly, miscommunication can occur due to the fact that language is not just a code. Communication is embedded within culture and therefore culturally orientated.